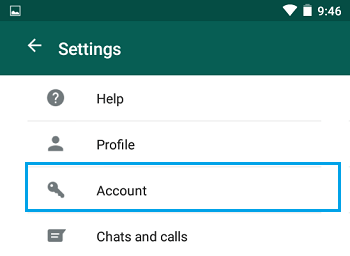 You may have come across a need to change WhatsApp Phone Number on your Android Phone in case you are thinking of changing your phone number or have already switched to a new phone number. 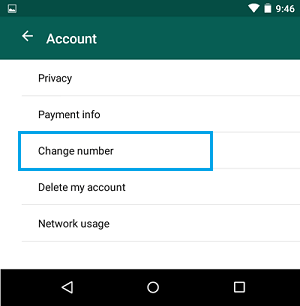 In this post we will be showing you the steps to change WhatsApp phone number on your Android phone or tablet. First, you need to make sure that your new phone number is indeed active and you are able to receive SMS messages and calls on your Android phone. This is important, as WhatsApp will be sending you a verification code via an SMS Message to your new phone number. Once you are ready, follow the steps below to Change WhatsApp number on your Android Phone or tablet. 1. Launch WhatsApp on your Android Phone or tablet. 2. Tap on the 3 dot icon at the top right corner of your screen (See image below). 3. Tap on Settings from the drop down menu (See image below). 4. Next, tap on Account. 5. Tap on Change Number. You will see a message from WhatsApp providing brief information about what happens when you change number on WhatsApp. 7. On the next screen, enter your old phone number in the first box and the new phone number in the second box (See image below). Note: You need to enter the phone numbers along with the country code. For example you will be entering +1 as your country code (in case you are living in US and Canada) followed by your actual phone number. 8. Tap on Done to confirm this change (See image in Step 7 above). 9. Now wait for an SMS from WhatsApp, the SMS will contain a 6-digit verification code. 10. On the next screen, enter the 6 digit verification code and verify your new number on WhatsApp. It is really important to understand that the verification code sent to you by WhatsApp is unique to your device and phone number. You should not try to guess the verification code, entering incorrect verification code too many times can delay the process of verification. 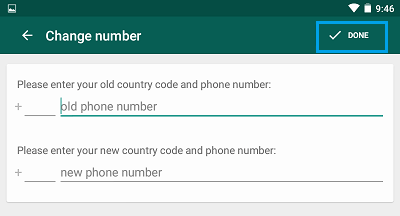 You can also choose to verify your new number by asking WhatsApp to call your number. Just tap on the Call Me link on your screen. Once your number has been verified, your new phone number will be registered as WhatsApp phone number and your old account information will be moved over to the new number. After migrating to the new WhatsApp phone number, your account associated with the old number will be deleted. 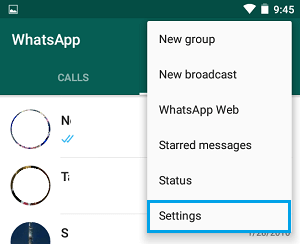 Your contacts will no longer see your old phone number on their WhatsApp contacts list. Since your old account will be deleted, all your data including your profile, groups, chat history and your account payment status will be migrated to the new account.